This was our third year spending the worst of Toronto's winter months in the warmth and sunshine of Buenos Aires summer season. It would be well worthwhile to read our 2008 and 2009 travelogues to gain further insight into the compelling reasons to visit this warm and gracious city. Passengers arriving from Canada must pay a new 70USD "reciprocity fee" each visit (131USD for Americans, but good for 10 years). Last year we met some folks who were very happy with the apartment they were renting at Pacheco de Melo 2095 at the corner of Uriburu. This was an ideal location for us, in the center of Recoleta, so we hustled over to find a rather new, attractive building with a lovely lobby and 24 hour security. The building manager introduced us to the owner of one of the apartments who happened to be in the building. The rest is history. We rented on the spot and can now tell you we were delighted we did. The unit is on the 5th floor facing Pacheco de Melo with a splendid balcony fronting the bedroom and living area where we could relax late in the afternoon, enjoy a glass of Malbec wine and plan our evening meal. If we decided to cook, the well-appointed kitchen, with dishwasher, was stocked with everything we required including a blender for Linda to whip up her famous fresh fruit smoothies. The living room had a generous size sofa, coffee table and upholstered bench. The glass top dining table and 4 chairs easily accommodated our dining needs with room for our laptop. The free wireless connection was excellent. There is an attractive entertainment center (flat screen TV and sound system) built into the wall opposite the sofa. The room-darkening shade came in handy when we required a bit longer sleep in the morning. There is a phone next to the queen size bed for free local calls to landlines and no charge for any incoming calls. The bathroom has a tub/shower, bidet, toilet and good size vanity with a hair dryer on the wooden shelf below. The air conditioning worked perfectly. Fortunately, we did not have to test the heating system. The weekly maid service included a total cleaning, linen and towel change. The building amenities include a rooftop pool and work-out center. There are laundry facilities in the basement, 3 pesos each for the washer and dryer. If you prefer, there are numerous laundries nearby that charge between 12 and 15 pesos per load for wash, dry and fold. The location in Recoleta is fabulous. All your basic shopping needs are within easy walking distance as are many dining options. 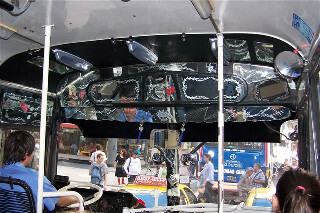 Being steps away from Avenida Las Heras, it is possible to make colectivo (bus) connections to just about anywhere in the city. After settling in we were off to do our initial shopping at a local Disco Supermarket. 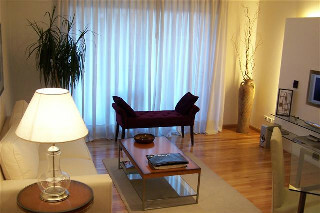 We chose the one at Rodriquez Pena near Las Heras. It's about a 10 minute walk and close to another market and lots of specialty shopping. There is free delivery if you spend at least 200 pesos, otherwise a charge of 5 pesos. You are given a fairly accurate estimate of when your delivery will arrive - most times within a couple of hours. We activated our unlocked cell phone with a prepaid SIM card from Movistar, the mobile arm of Telecom Argentina. We make all of our long distance calls from our computer via Skype. 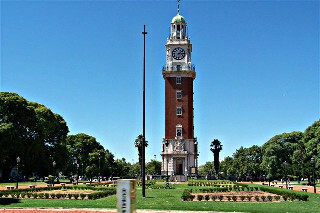 With our basic needs now under control we were ready to begin life in beautiful Buenos Aires, a city steeped in European and Latin culture with a relaxed pace and charm to spare. And so we become "Porteños" and do our best to share their warmth, kindness and friendliness. We explore the streets of our favorite Barrios endlessly finding new treasures amongst the already familiar landmarks. Though we do still love walking, we find that mixing it up with colectivos makes for much more efficient use of our time and energy. There is an excellent subway system, but we much prefer being above ground and seeing what's around us. The fares for both are 1.10 to 1.25 pesos (about .28 to .33 cents US). You've got to love the colectivo experience and appreciate the agility of the drivers as they race along the wide boulevards and the narrow streets at the same high speed dodging other buses, cars, taxis, motorcycles, bikes and dashing pedestrians. If you are going to be in the city for any length of time and want to use the colectivos, we suggest you buy the "Guia T de Bolsillo" Capital Federal at any magazine kiosk. This booklet enables you to determine which number bus you should take going and coming. Even without the book you will find the locals more than willing to help. In preparing for our trip we came across Teresita's Culinary Tour. Teresita Bella is an expert in Latin American cuisine and well qualified to conduct this highly regarded culinary program. We would learn about Argentine culture through the preparation of traditional local food recipes and by tasting regional wines. The charming Buddah picked us up at our apartment and whisked us to the picturesque town of Adrogue about 45 minutes away. This is a suburban paradise. Lovely homes grace lush grounds with streets lined with a variety of trees and shrubs. The downtown is home to at least 60 restaurants and two farmers markets along with an abundance of food shops. A perfect venue for a foodie experience. Teresita's bed and breakfast is a charmer, designed by her Pediatrician husband, Raul. The main house and two rear cottages sit in the middle of a tropical garden. 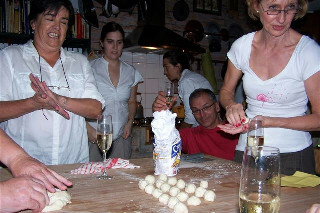 One couple of our group stayed in one of the cottages and were delighted with the accommodations and food. In preparation for our cooking and dining experience we started with a walking tour to town. The first stop was a farmers market where we scooped up some fruits and veggies for our fridge and chatted with the local farmers. Buddah was kind enough to store our purchases in his vehicle for the trip home. Our first stop along main street was a wonderful bakery where most in the group filled boxes and bags and were reluctant to leave. Further on we got a lesson in the various cuts of carne (beef) and their names from the local "carniceros" (butchers). Finally a visit to a mouth watering deli with a large array of meats, cheeses and prepared foods. We stopped for beverages at a lovely open air shopping center in the heart of town and got to know one another and discuss travel experiences. Back at Teresita's kitchen we donned our aprons and began our culinary experience by making empanadas: rolling the dough, piling on the filling (meat, onion, raisins, olives, egg, scallion and spices: paprika, cumin, chili), folding the dough over the filling, squeezing and pinching to close. Mine were not picture perfect in spite of the fact I enjoy squeezing and pinching. While the empanadas were baking we regrouped in the rear garden to enjoy the culinary delights being prepared by chef Alejandra Bonini. We started with Pejerrey, a local white fish, marinated in white wine and vinegar served on homemade crostini, partnered with Saurus Patagonia extra brut sparkling wine from Familia Schroeder. Our spicy beef empanadas humita were served with Colome Torrontes, a white wine from Salta, pale gold in color with clean, crisp aromas of grapefruit, roses and apricot. 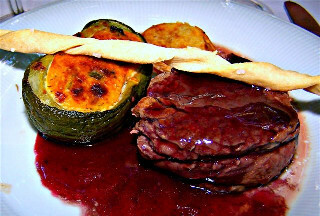 The main course was bife de lomo with stuffed zucchini, potatoes and a Malbec sauce. A rich Malbec from La Flor de Pulenta with aromas of fresh fruit, vanilla and tobacco imparted by oak was a perfect match. And finally - dessert. Poached pears in Malbec with ice cream. A Ciclos Torrontes Late Harvest from Salta with floral, raisin and honey aromas finished us nicely. It was a fine day. We met interesting people, had an instructive and entertaining program, and a memorable meal. Home please, Buddah. We found food prices to be up since last year. They remained stable throughout January into February and then as the vacation period ended and folks returned to the city prices magically increased. We did not feel it because the peso had dropped in value and we received more pesos for our dollars. It has to be having an effect on the Porteños living on local currency. It sure is hard to tell if there is hardship. 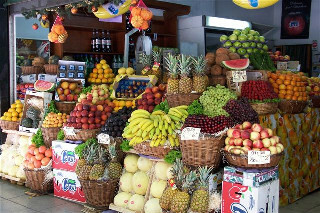 The shopping streets are crowded, restaurants and cafes are busy, the lines in the supermarkets are long. Some business people complain that sales are bad, while new businesses are opening daily. For the most part we saw people going about their business and life with a spirit of happiness and contentment. Of course what we see in the city center does not reflect what is happening in the suburbs and the rest of the country.